WOW Board knows that it has driven away many Orthodox and non-Orthodox worshipers by their religious practices, non-stop desire for media attention, their willingness to criticize Israel in North America and Europe during the years of the Al Aqsa Intifada. We have all heard the many claims made by Women of the Wall, explaining why no tolerant person who loves other Jews would oppose them. So why do so many women do just that? To answer the question, we look at their claims, along with quotations that may seem to tell a different story. The quotes here are provided with a bare minimum of editorial comment, provided when necessary to explain the context behind a quotation. I know most of the women who go don’t pray the same way in their private lives… In actuality, they may not pray every morning at all. Some women pray/sing at the top of their lung in an operatic voice. I don’t think they would do that at home or in their local beit knesset (synagogue). How am I supposed to pray like this, d*** it? Fortunately my friend Miri reminded me that I don’t know how to pray anyway… I look toward the kosher women on the other side of the barrier and choose a potential victim to argue with. Perhaps this tall, thin girl… I urge Miri to tempt her to come nearer. I want to see and be seen. At least they notice us now. Funny thing, that. We thought when you pray, you only care to be noticed by G-d.
“Should WOW be teaching it is wrong to continue practicing Judaism the way it has been taught” implies that WOW teaches this, when in fact WOW does not & has no such agenda and has tremendous respect for women who feel empowered just as they are. Feminism is the revolutionary notion that women are people. In context, she implied that traditional women who oppose WOW believe themselves to be sub-human. WOW models to all Jewish women who pray at the Kotel that women can take control over their own religious lives… their world view is changed. Like it or not, the sights and sounds of women leading services may initially shock them but then, when they get used to it, it will, it has to, change their world view. Women will no longer be seen as following men when it comes to communal prayer… but as individuals who are able to function religiously, on their own, without the “help” of men. This represents a revolution in haredi lives… And that is why WOW must win the struggle to remain at the Kotel. Our cause transcends women praying, women wearing tallitot… A woman reading Torah at the Kotel represents an historic correction, a tikkun, for centuries of deprivation, of secondary status. 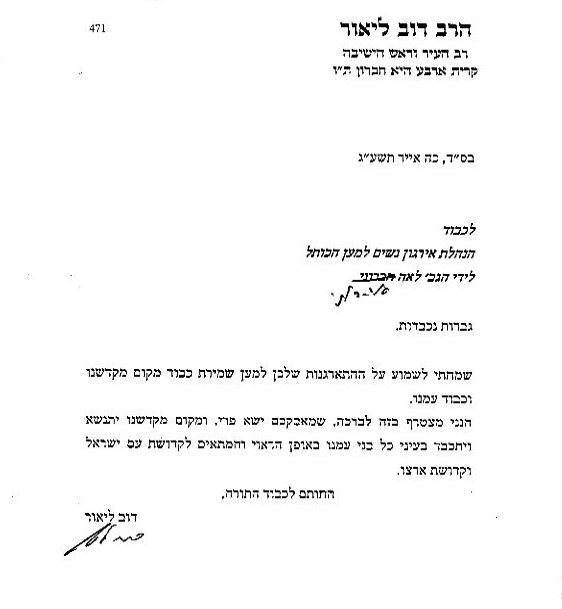 Some [Charedi women] are aroused by the subversive possibility of women’s autonomous public prayer. We have even had the honor of welcoming a few ultra-Orthodox young women into our feminist circle. Women of the Wall is the right group for bringing about change in Israel but not the right group for bringing about change in the Orthodox world. Anat Hoffman: I think when you change the holiest site for the Jewish people, you’re actually asking “why not” about a variety of other life choices dictated to Israelis… marriage and divorce in Israel… some of us wish to get buried not by Orthodox custom. BBC: So your aims are broader than simply what happens at the Western Wall. As a founder of Women of the Wall in 1988, I regret that our purpose of achieving full, joyous public women’s prayer celebration, and a vibrant pluralism at the Kotel and beyond has yet to be fulfilled. Over these decades of spiritual activism and deep analysis, I have formulated a new Jewish theology … Please look for my book Israeli Feminism Liberating Judaism: Blood and Ink… Blood and Ink contributes toward liberating religious culture from its gender oppressions, and toward rendering religion a liberating force in society. “Let’s share time,” she suggested. For six hours a day the Wall will be a national monument, open to others but not to Orthodox men, she said. We are trying to liberate Judaism from the ties of an Orthodox hegemony. I definitely see that the day will come when people will tell you: You know what? There was a time… no, you don’t remember this, but there was a time when there used to be a mechitzah here all the time! You don’t believe it. There used to be a time when women were arrested because they wore a Talis. Once it was that way. And yet there was some sweet lemonade squeezed from those bitter lemons: With nowhere else to go, the men and women there prayed together in a fully egalitarian, mixed-”seating” (“standing”?) minyan. CNN IReport, featured with excitement on WOW Facebook page. Their main aim is to end separation between men and women at the Western Wall. Multiple comments encouraging WOW to reject or correct this statement are ignored. “I don’t know. I don’t like places. I like people. The Western Wall is an opportunity; it’s what we make of it. For me, this is the place where my women friends and I were born as a community. Some women pray/sing at the top of their lung in an operatic voice. I don’t think they would do that at home or in their local beit knesset (synagogue). Women of the Wall refrains from participation in events that pit women against women. Women of the Wall rejects the premise of this article. Women of the wall has no rivals and we embrace all women’s prayer! If we are not rivals, how would meeting with us “pit women against women?” W4W is in favor of dialogue and discussion, even if we will agree to disagree on many issues. It wasn’t a protest, it wasn’t a demonstration, it was a prayer group. They came to Israel in 1988 to attend the first International Jewish Feminist Conference. They went to the Western Wall, wishing to read from a Torah… I had a folding table and they asked me to join them. You know, for demonstrations you always need a folding table and a megaphone, and I have both. We truly welcome the young women and their prayers. The women’s section was full of seminary students bussed in for the purpose of blocking out Women of the Wall. Thousands of ultra-Orthodox (haredi) high school girls and women cursed, jeered, and blew whistles non-stop… hooligans-upon-demand… a psychological lynch-mob against other Jewish women. These were the same thousands of girls who came to pray, as they had done two months prior. Two women, possibly mother and daughter, had whistles. As feminists, Women of the Wall does not believe in attacking other women, even if they attack us. We believe in empowering women and making the world a better place for women. 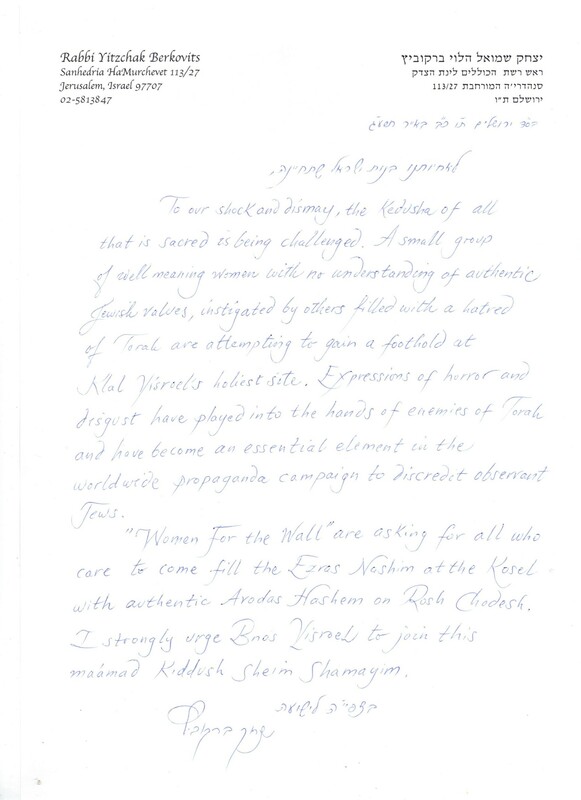 The referenced piece, by Alison Kaplan Sommer, was a direct personal attack on Ronit Peskin, alternately described therein as the “self-appointed leader of the anti-Women of the Wall movement” and the “feisty, young, self-styled ‘founder and director'” of Women For the Wall. The word “feisty,” which comes from the German “feist,” a small dog, is almost always applied to a woman. Women are now being forced to obey ultra-misogynist views of what women are allowed to do… Why is it still so hard for religious conservatives to acknowledge women as spiritual and religious beings, capable of non-coerced autonomous, independent, and halachic (religiously lawful) prayer? Adjectives like spiritual, religious, non-coerced, autonomous, and independent, in her worldview, apparently cannot be applied to traditionally observant Jewish women. So who is failing to acknowledge women as spiritual and religious beings? Probably the vast majority of haredi women do not know that halacha, Jewish law, permits women to wear talit and tefillin, and read Torah from a Torah scroll… anyone with a modicum of learning in Jewish texts knows that halacha does not prohibit women doing these things… That haredi women… do not know this, speaks volumes about the subjugated place of women in that society. Had she actually asked a typical haredi woman, that woman could have shown Prof. Mangus how to wear her Tefillin correctly. We shouldn’t mix normalcy and Orthodoxy. They both end with a ‘y’, but they are not the same concept. A woman reading Torah at the Kotel represents an historic correction, a tikkun, for centuries of deprivation, of secondary status. Women who occupy subordinate status within an enclave of fundamentalist, religious patriarchy, are routinely expected to police and monitor… Women perform female genital mutilation, murder their daughter-in-laws for their dowries, and participate in the honor murder of their daughter or sister if either has stepped out of line, however slightly… filled with so much hate. To better perceive what it means to be hate-filled, Ms. Chesler will need a mirror. It would be excellent to post the full source for these quotes. Otherwise, supporters of WoW will see the edits and assume this was a hatchet job. Thanks in advance for providing more context. Jason, we linked back to the source for each and every quote for exactly the reason you specified. We couldn’t post each full article, or even enough extraneous content to prove each quote was “in context,” without making the page far too long to be readable. In most cases, the link is from the speaker’s name. Thank you for the opportunity to clarify that!